Prestige Properties have been innovative and creative in their approach to creating some of the finest residential spaces in Bangalore. With diverse project specifications, the Prestige Group has maintained high benchmarks for providing impeccable high-quality realty services without compromising resident safety and well-being. 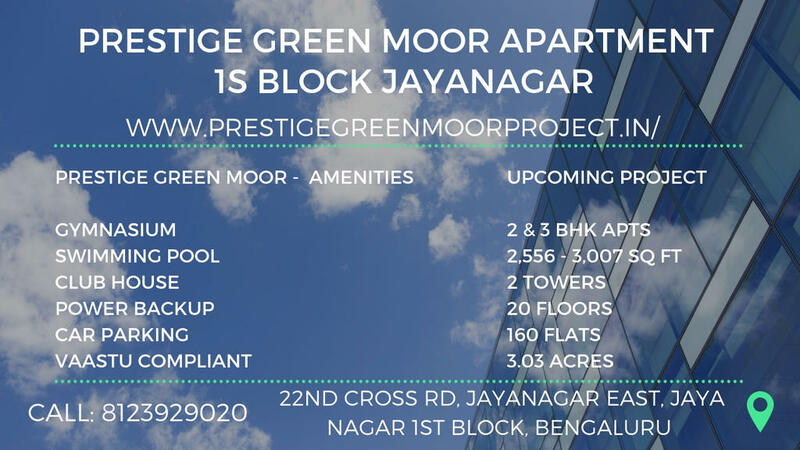 Prestige Green Moor by Prestige Properties is one such project that is strategically located at Jayanagar 1st Block in Bangalore. The location has everything that an investor would look for. Prestige Green Moor is located close to great schools, colleges and medical institutions that contribute to the credibility of the project. Other than that, Jayanagar is close to high-profile shopping and entertainment multiplexes. The project has taken great efforts in establishing an eco-friendly environment within the premises so in-house residents can lead ecological ways of living. With high-rise buildings, residents can have easy access to pristine landscaped gardens surrounding the project. Prestige Green Moor also schedules site visits for residents so they have a real-time experience of the site and property development from the conceptualization phase until completion. Amenities and floor plans at the site are unique and diverse at the same time so they cater to individual residential expectations. Rest assured, Prestige Green Moor Jayanagar for the provided benefits is the project to reckon with. Bangalore has developed tremendously as far as real estate developments are concerned. Especially parts around Jayanagar, residential properties are plenty that is surrounded by green covers for an ecological lifestyle. After the introduction of Bangalore Metro services, residents are seamlessly connected to other parts of the city from Jayanagar. Prestige Green Moor Jayanagar portrays high degrees of residents from diverse backgrounds that set the balance in the society. Jayanagar is cornered by some of the finest shopping complexes for every need. Be it clothing, electronic accessories or home-related needs, Jayanagar is the place to be. The project offers that extra reach of convenience by devising state-of-the-art amenities and other social benefits. Prestige Green Moor Amenities comprise of an equipped gymnasium and swimming pool for kids and adults, party hall for weekly celebrations, rainwater harvesting is practiced within the premises so residents live in a hygiene filled environment. There are a number of educational and financial institutions around Prestige Green Moor Jayanagar that enables residents to spend more time with the family. Quality educational services are offered at affordable price ranges that is an added advantage for residents. The project has tied with several reputed banks that enhances a hassle-free booking process. Prestige Green Moor has also adhered to strict RERA approved time deadlines and have been transparent when it comes to sharing information regarding amenities, floor plans, and every design specification to establish key relationships with profitable clients. First-time homeowners needn’t worry now as architects and engineers are present at the site at all times to provide impeccable service regarding any residential need.